This is ALG’s flag-ship rail. The EMR V0, formerly known as the EMR MOD-0, laid the ground work for all future versions of the rail. The design principal behind the EMR V0 was simple; maintain the high quality and high functionality ALG is known for, and more importantly, keep it affordable. The EMR V0 is machined from extruded 6061-T6 aluminum and utilizes a proprietary rock solid 2” barrel nut machined from 7075-T6 aluminum, and includes a trick wrench that will apply the proper torque and index the barrel nut to the gas tube all at the same time. No torque wrench is required. The EMR is also very lightweight, weighing in at 8.96 oz. for a 10” including installation hardware. Since the EMR has no top picatinny rail, it is very ergonomic for those who use a thumb over style grip. A co-witness rail section is included which can be mounted anywhere along the 12 o’clock position of the rail and will allow a front site to be mounted and in proper alignment of the upper receiver. The EMR V0 features two integrated anti-rotational QD slots at the base of the rail at the 2 and 10 o’clock positions. 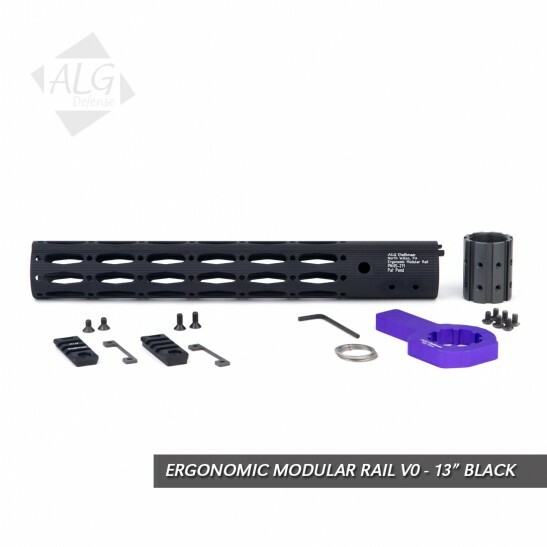 It also includes a removable rail section which can be mounted at the 3, 6 and 9 o’clock locations as well as the upper and lower 45° locations, making the EMR V0 extremely modular. Please note ALG rails no longer include a barrel nut wrench, it is available as a separate item.